Like naval architects in other nations, German warship designers shied away from superfiring turret arrangements, fearing that the blast effects from the upper turret would injure or even kill the crew of the lower battery. The United States Navy fitted superfiring turrets on its first dreadnoughts, the South Carolina class, without any damage to gun crews. In Germany, retired Grand Admiral Hans von Koester, the newly-elected president of the German Fleet Association (the politically-powerful civilian booster club for naval expansion), pushed for adoption of what he called “the USN Pattern” – all gun turrets along a battleship’s centerline, with super-firing pairs fore and aft. Despite his age, Koester – a former naval architect himself – rejected the inherent conservatism of German warship design. 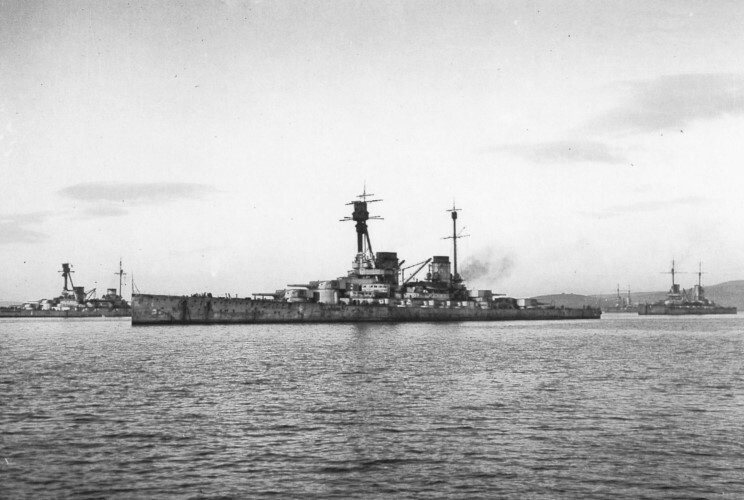 While Germany had built two classes of dreadnoughts, they were technically much less advanced than those of the Royal Navy, not only in their turret layout but also their old-style reciprocating engines. Despite testing at Krupp’s proving ground that showed no excess pressure in the lower turret, the Germans moved slowly to adopt the arrangement, trying it out initially in the battle cruiser Moltke. Gun crews showed no ill effects, and German ships adopted the USN Pattern starting with the König-class dreadnoughts and Derfflinger-class battle cruisers. Both the admirals and the architects realized that they had developed an extremely fine design with Derfflinger, ordered in 1911 and commissioned in 1914. She followed the USN Pattern, with two turrets forward and two aft. The two aft turrets had somewhat more separation between them, thanks to the larger turbine room below. Derfflinger combined speed, protection and firepower and the Germans repeated her design for the battle cruisers ordered under the 1912 (Lützow) and 1913 (Hindenburg) fiscal year programs. Seeking heavier armament, but still enamored of the Derfflinger design, the Navy enlarged her and increased the main armament to 350mm (13.8-inch) for the battle cruiser ordered under the 1914 authorization (Mackensen) and ordered three more under the Wartime Construction Program. Another trio were ordered in April 1915 using additional special wartime funding made available to replace armored cruisers lost in action (Scharnhorst, Gneisenau and Blücher); these latter vessels had their main armament increased to 380mm (15-inch) guns but very similar to Mackensen other than the noticeable difference of a huge single funnel. Thus when the special committee convened by Alfred von Tirpitz to study new major warship construction for the High Seas Fleet met in the spring of 1916, Germany already had eight battle cruisers under construction or ordered. The committee spent a great deal of discussion on the Typenfrage, the question of whether the Navy should build both battleships and battle cruisers, or simply one class of fast battleship that could fill both roles. So while the committee looked at fast battleship designs, it also continued to solicit sketches of new battle cruisers, “great cruisers” in German parlance. The Construction Department presented three new designs on 19 April 1916, adding a fourth a week later. Like the Mackensen class, the new designs drew heavily from Derfflinger, adding another boiler room and slightly more length than Mackensen. All of the proposed ships carried a main armament of eight 15-inch guns in four turrets and sixteen 150mm (5.9-inch) guns in a casemate battery, plus eight 88mm anti-aircraft guns and five torpedo tubes. All three designs also had an identical armor scheme to Mackensen. The differences lay in the power plants, and the changes to the hull that had to be made to accommodate them. GK1 had 32 boilers, producing 110,000 horsepower for 27 knots; GK2 had 36 boilers, producing 120,000 horsepower for 27.25 knots. GK3 also had 36 boilers, but produced only 115,000 horsepower for 27 knots. The Derfflinger-class battle cruiser Hindenburg (Derfflinger herself in left background). That gave a slight increase in speed over the three improved Mackensens, which produced 100,000 horsepower from 32 boilers and was expected to make 28.75 knots; Mackensen herself made 90,000 horsepower for 27 knots. Despite the incremental improvements in exchange for added costs and production delays, the committee liked the new proposals and recommended replacing the design for the three improved Mackensens with a new one. That decision owed more to naval politics than military necessity. A British submarine sank the elderly armored cruiser Prinz Adalbert in October 1915, opening a potential funding line for her replacement. But Kaiser Wilhelm warned his new Navy State Secretary (the Navy’s political chief) Eduard von Capelle that the soaring costs of the new “great cruisers” could make approval difficult even during wartime – Mackensen had been projected to cost 66 million gold marks, compared to 58 million for Hindenburg ordered in the previous fiscal year. Whatever shipbuilding resources could be made available would have to go to expansion of the submarine force. With approval for new ships in doubt – if even the Kaiser balked at the cost, the civilian leadership could not be counted on for support – Capelle and the admirals reasoned that the three new great cruisers for which they currently had approval might be the last until after the war ended and perhaps for some time afterward. In that case, it would be best to build those three ships to the most recent design available. Work began in the summer of 1916, with one great cruiser order placed at each of three private shipyards: A.G. Vulkan in Hamburg, Krupp’s Germaniawerft yard in Kiel and the Blohm & Voss yard in Hamburg that built most of Germany’s great cruisers. Construction proceeded slowly, and unlike the Mackensen class work never formally stopped before the war ended though it appears that very little progress was made. Design work had not been completed when work began, though since the ship was so similar to Mackensen this probably would not have been a problem until the ship was far more advanced. All three ships appeared in our Jutland game in their improved-Mackensen guise, as originally intended by the German Admiralty: the same hull as Mackensen, with bigger guns but no other appreciable differences. 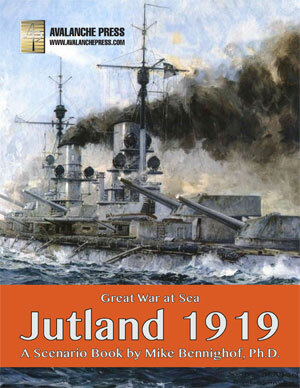 In our Great War at Sea: Jutland 1919 supplement they appear as the Admiralty also intended, four additional great cruisers built to the new design; in game terms there’s not a lot of difference beyond the larger hull (the increase in ship speed isn’t enough to affect game speed).